Non-Adhesive Tape is a great tool for wrapping and securing bandages. It's also versatile enough to be used for several body limbs including arms, legs, hands, feet, and others. And while these types of bandage don't specifically have tape to adhere to itself, the wrap can adhere to itself for better security. 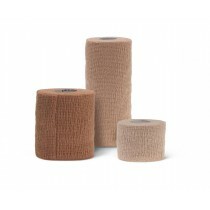 Below are some available options for helping you secure a bandage. Color Coding: A color coding system works well for medical institutions wanting to differentiate an injury type or location. 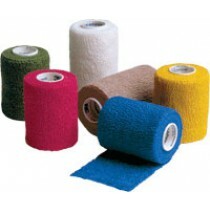 3M, one of the manufacturers of color tape, has plenty of colors you can choose from so stocking up won't be a problem. 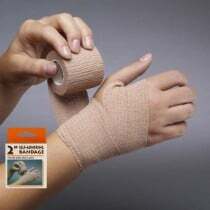 Latex and Latex Free: Like many bandages and overlays, non-adherent wraps can be purchased in both latex and non-latex form. 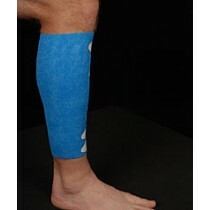 Patients prone to latex reactions can choose Andover's latex free wrap in a number of colors. Latex options are available if needed as well. 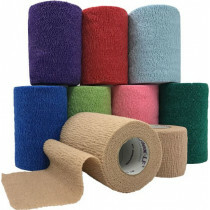 Body Part Coverage: Many tapeless bandages still have the advantage of being able to be used to cover several different body parts. 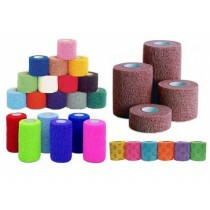 Tapeless Medical's tapeless reusable dressing holder can be used on the leg, arm, foot, hand, wrist or other body part. If you want to wrap around the foot, ankle and wrist you can look for a simple neutral color bandage that will fit your needs. If you need to wrap around a body part and you're choice was to go with latex or non-latex, Vitality Medical has all the right types of wrapping you need.